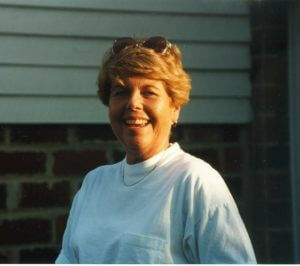 Catherine Rhett Dooley of Fairhaven, Maryland passed away peacefully on January 25, 2019 after a long battle with cancer. She was 76. During the last two years, Cathy was cared for by a host of loving family members, close friends and dedicated caregivers. Cathy was preceded in death by her parents Edward and Elizabeth Rhett and a sister Patricia Keating. She is survived by her sister Susan Rhett Mills, and by her children from her former marriage to Edward Dooley: daughters Kimberly McCaig (Mark), Nancy Dooley (Reid Treadaway), and son Michael Dooley (Emily). Very dear to her were her grandchildren: Maggie, Colleen, Elijah, Finnegan, William, Sawyer, Saxon and Lincoln; her nieces and nephews: Brooke Mills, Benjamin Mills, Sam Keating and Sarah Keating; and caregivers, especially Helena Alexander; and all of her Fairhaven family and friends.